The IMF on inequality: beyond organised hypocrisy? So far, the nature of Christine Lagarde’s speeches and the discussions I had with Fund staff this week suggest that there is more work to be done. 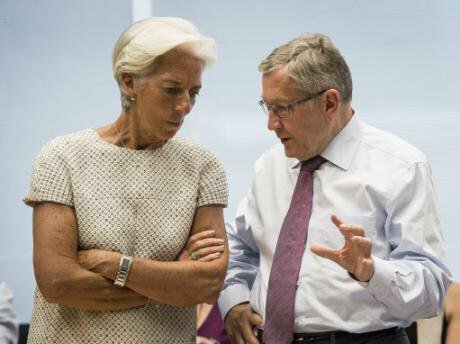 IMF Managing Director Christine Lagarde and Klaus Regling, Managing Director of the European Stability Mechanism meet to evaluate Greece's request for a new bailout package,July 2015. Wiktor Dabkowski DPA/Press Association. All rights reserved. Recent commentary on research I conducted with Paul White, has caused a stir. Our paper in the Journal of Australian Political Economy was the subject of a review in The Conversation and the Huffington Post. The review, by the eminent academics political economist Frank Stilwell and historian Christopher Sheil, suggested that the IMF ‘was showing some hypocrisy on inequality’ and summarised our findings and critique, as well as some wider debates on inequality. The IMF responded strongly to this, arguing that they ‘are walking-the-talk’ on inequality and, further, that a series of operational programmes with member states are ‘bridging research and reality’. The IMF response drew attention to the high-level policy commitments and research that we draw on in our paper and a number of initially ‘pilot’ programmes which focus on different aspects of inequality with specific countries. Their response suggests that there are now 15 more of these on inequality, 9 on gender and 15 on climate change. The Fund also kindly invited me in to speak to them this week about our paper and their new operational work. It goes without saying that Paul and I very much welcome this discussion of our work and are grateful to both Stilwell and Sheil, and the IMF for taking the time to engage with us. In the context of this debate Paul and I thought it worth restating the findings and analysis in our paper. This is useful because the debate highlights the importance of our findings, the limitations we identify, and plans for future research to address those limitations. The IMF’s response may well open a fruitful avenue for this research – and I dwell on some of this at the end of this piece. Before going on to our initial research, we ought to comment on the IMF’s response to Stilwell and Sheil. Our research looked at mainstream IMF work (see below) with a range of borrower and non-borrower member states. Unhappily, our sample only overlaps with the pilots the IMF mention in relation to China and the US. The US stood out in our sample as being the country we looked at with the most coverage of inequality in its IMF surveillance document. In relation to China we were quite critical; noting a remarkable absence of discussion of inequality. That said, the IMF’s defence may well be in line with one of the potential interpretations of our empirical findings; that the IMF’s commitment is genuine at the top of the organisation, but that this has only partially pulled through to operational practice. That ‘pilot’ programmes are exploring what work the IMF can do with member states on inequality is evidence in itself that this work is not yet mainstream. The bulk of our paper is focused on exploring one simple empirical question. We noted the IMF’s research agenda and policy commitments on inequality as set out in a series of significant research and policy papers, speeches of Christine Lagarde (the IMF’s Managing Director) and interviews that I conducted in 2014 with senior officials at the IMF. We set out to explore whether these commitments were present in IMF operational policy with member states. This is important for several reasons. First, the IMF has in the past been heavily criticised for promoting policies which might increase inequality such as cutbacks in state expenditure, financial and trade liberalisation, privatisation and de-regulation. Second, the IMF is unusual among international organisations, in that it has leverage to ensure that some of its members – those who borrow money from it – implement the policies it recommends. Even countries that do not borrow, may have an interest in implementing IMF recommendations because IMF reports might act as a signal to financial markets about the quality of a government’s economic management. As such, the IMF’s seal of approval might affect their ability to borrow from other sources. We compared these documents with those produced prior to the changes to see if there was a change in practice. We found that the changed operational guidelines were complex but that it was difficult to discern the same level of focus on inequality in these, as was present in the high-level policy and research documents. We found “considerable discussion of inequality” but that “some of it appears much less certain about the benefits of reducing inequality than the high-level documents” (p206). In terms of the programme and surveillance documents we found very little discussion of inequality. It was more present in non-borrower documents, especially the United States, (a notably unequal society among similar advanced OECD countries), but the concern might reflect the interests of country authorities rather than the IMF. Given that the IMF response identifies the US as one of their inequality pilots, this might also be an explanation. In both borrower and non-borrower countries we found that the policies identified by the IMF as reducing inequality were less present than traditional Fund concerns with growth, fiscal consolidation and exchange rate stability. However, we did find some small degree of change over time to give distributional issues more of a priority. In seeking to explain these findings, we suggested that there were several possible explanations. One of these was Catherine Weaver’s ‘organised hypocrisy’ thesis in which high level rhetoric is used as a legitimation strategy to justify otherwise unpopular policies, which do not fit with the rhetoric. This is a noted line of explanation regarding international organisations, including the IMF (for e.g. see here), in the academic literature. We acknowledged this argument but suggested that we were “tempted to go further” (p213) to suggest that the high-level commitment to reduce inequality was genuine, but had not fully percolated through to operational practice. As an aside, in other papers I have hypothesised that such a commitment might reflect a genuine concern to pursue the IMF’s long-running mandate to promote greater inclusion in the global economy, while protecting this process from systemic risks. Such risks – which might include inequality and climate change – might result in social backlash (as for instance in Brexit or the election of Donald Trump) which undermine the process of expanding the world market (a ‘New Politics of Inequality’). However, we felt further evidence was needed to empirically substantiate this possible explanation. Reflecting on the meeting with IMF staff today, I would conclude that there is some evidence to support this claim. Our attention in the paper then turned to explaining the gap between rhetoric and operational practice outside of conscious hypocrisy. One possible explanation might just be institutional and individual inertia. We cited other research that suggests that the training of the professional economists who staff the IMF might just be resistant to the high-level rhetoric. In sum; change is difficult to implement and takes time. Recent speeches by Christine Lagarde and our own interview data suggested that this may be the case. At the time of writing the Journal of Australian Political Economy piece, we had insufficient data on which to base any firm conclusion. Results of the discussion with senior IMF staff this week in research, policy and public relations offer some support for our thinking here. If this is the case though, both our research and Stilwell and Sheil’s commentary on it, are useful to those in the IMF who are driving the reform agenda. We concluded by noting the limitations in our data and suggesting how future research which might address these. We envisage continuing and broadening our scrutiny of programme and surveillance documents to look for evidence of greater change as more time elapses. Second, we thought it useful to enquire with IMF staff who were involved in discussions about the changes to operational practice, and about the debates and interests which shaped the outcome of the process. Finally, we thought it useful to undertake qualitative research with those involved in discussions between the IMF and country authorities about what considerations shaped the production of programme and surveillance documents, including the policy recommendations contained within them. The meeting this week with Fund staff suggests a slight revision to this plan. We’ll expand the sample, but include within it some of the pilot programmes. We’ll also review the Fund’s own work to assess the extent to which inequality and labour market issues are included in its operational work with member states. Finally, our engagement so far has been on the basis of holding the IMF to account for mainstreaming its rhetorical commitments in operational practice. If it turns out that the Fund is justified in mounting such a strong defence of its work in this area, then our attention should shift to assessing first, the extent to which the policies it recommends to reduce inequality are effective in doing so and second, how the work undertaken so far can be more effectively mainstreamed throughout its operational practice. So far, our research – and the nature of Christine Lagarde’s speeches and the discussions I had with Fund staff this week – suggest that there is more work to be done to mainstream its headline concern to reduce inequality. But its openness to engagement on the issue gives scope for optimism about the prospects for this. Perhaps this research might help the IMF show just how serious it is about ‘walking-the-talk’.